I've just put a deposit on an RV-8 that had an "issue" on a landing. Looks like I'm going to have to rebuild from the spar carry thru fwd. I'm going to try and find a set of unfinished wings. Just looking for any ideas about making sure all the rest of the airplane is square, and going to need fwf kits. Gear is ok. I'm just an old Pitts builder so I need all the help, advice , and moral support I can get!!! 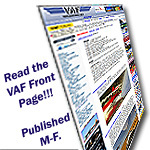 Hi Bill, welcome to VAF - you came to the right place! Good luck with the project - ask any questions you have and the good folks here will try to help. There are a lot of experienced RV builders just west of you at Butler County (Ohio) airport - KHAO. 10+ RV8's have been built there by current residents, along with numerous other RV models. Come on over for a visit sometime, and bring some pictures of your project.